Around 55 years ago, when Honda was just getting started selling motorcycles in the United States, they came up with a brilliant advertising slogan: “You meet the nicest people on Honda”. The idea was to make motorcycles and motorcycling appealing to the general public: families, students, housewives, etc. 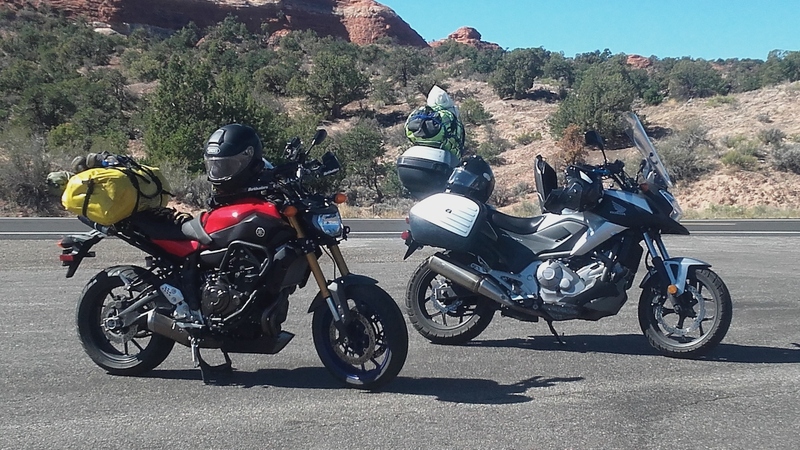 Decades later, motorcycling has come together more than ever in the United States. 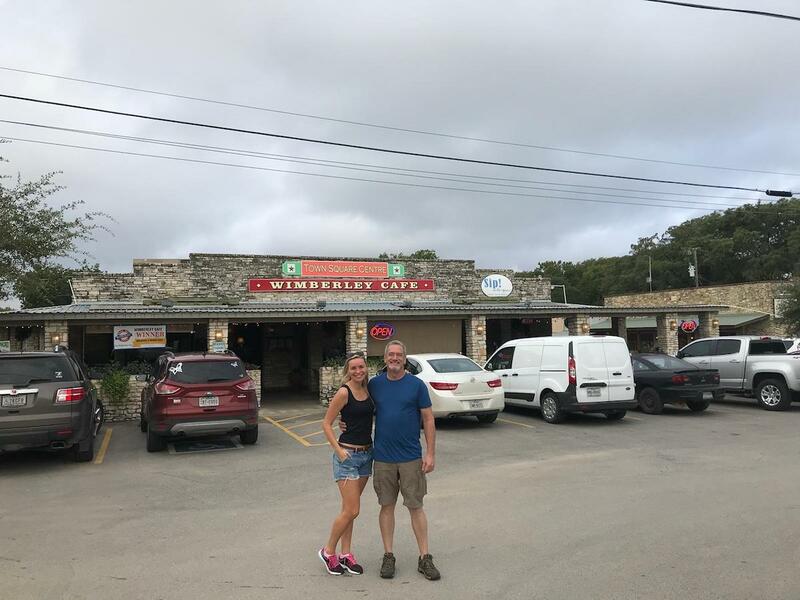 Thirty years ago, it wasn’t unusual for a rider on a Japanese motorcycle to pass a Harley Davidson going the other direction, and neither would wave. Today, nearly all motorcyclists wave to each other as they pass on the highways and backroads of this country. When I returned from my long ride in 2016, I said half jokingly that I now have more friends in other countries than in the United States. I was amazed at the overall friendliness of people around the world towards a complete stranger, simply because I was “out of place”…an odd duck on a small motorcycle. 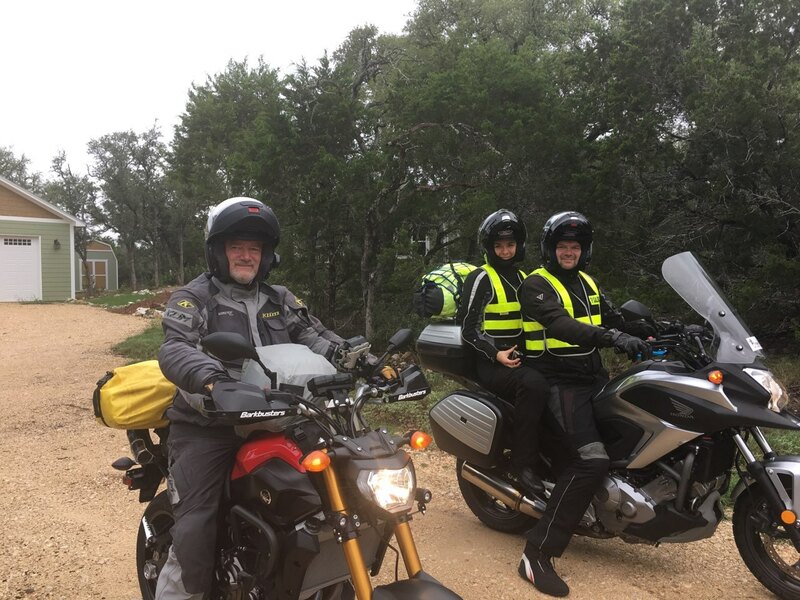 Flash back: In 2014, one year before I began my journey, I met two motorcyclists from Poland at a campground in Texas. We spoke for maybe 15 minutes. Two years later I met them again when I rode through Poland. 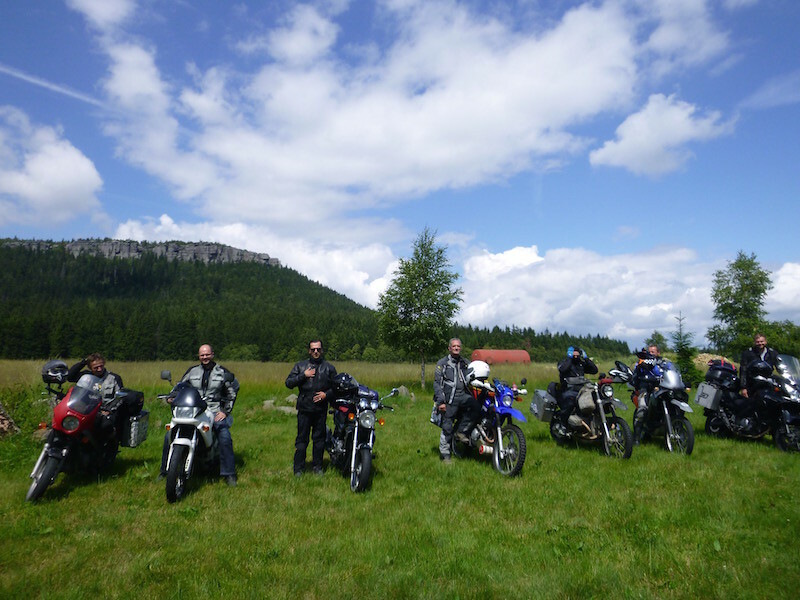 At that time they hosted me and I spent a week riding with their friends and relatives throughout southwestern Poland. Two of the people I met in Poland were Marcin and Ela. 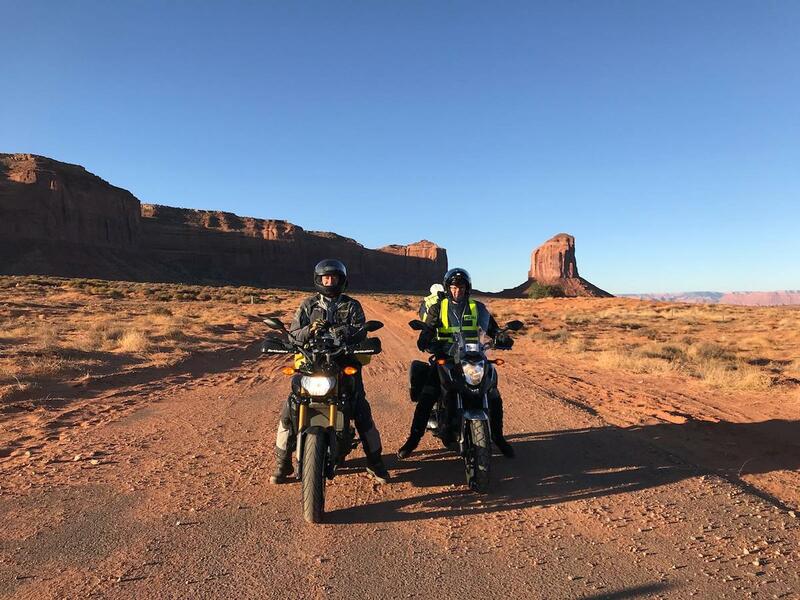 They rode their Suzuki V-strom with me for several days. 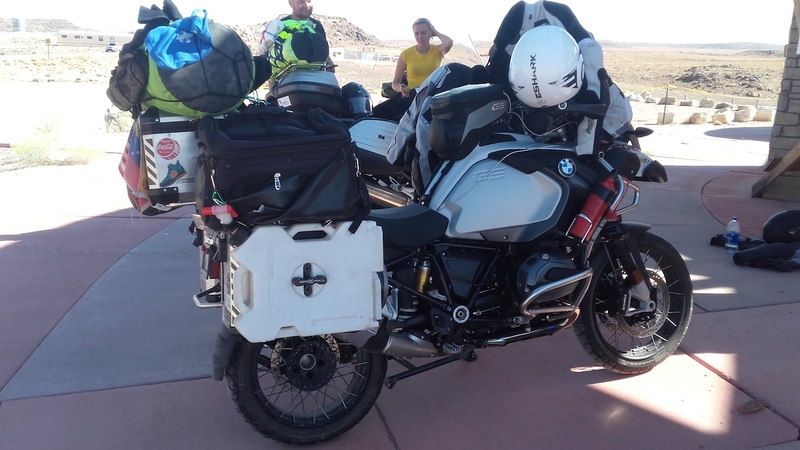 Flash forward: Marcin and Ela have arrived in the States and are preparing for their “Ride Across America”. We are riding together again, this time through the western US. They flew to Texas from Poland and I picked them up from the airport. They spent a couple of days with me before we all headed out. With Ela, their first morning in the States. Somewhere on the road…Arizona? Utah? They are headed to Canada. Ela has done a great deal of research about the American West and has a list of destinations we are visiting. I am amazed and embarrassed that this young woman from the other side of the world, who is shy about speaking English, knows more about my country’s regional history than I do. This might win the prize for the most overloaded GS I’ve seen since Argentina. This couple had their dog in the black bag on top of the right pannier, a Yeti cooler on top of the left pannier, huge speakers mounted in the front of each pannier, fuel bottles on both sides in the front, a Rotopax water can on the outside of the right pannier, and a Rotopax gas can on the outside of the left pannier, and just generally a lot of stuff. But hey, everyone has their own amount of “stuff” that is “right” for their needs. I didn’t even have panniers. The big yellow bag on the back of my bike is all of my camping and cooking gear and a camp chair, same as on my RTW trip. All of my clothes fit in my tank bag. That’s basically all I took. While stopped for lunch, we stumbled onto nine more Polish riders. They were riding from Chicago to L.A. on Route 66 on Harleys. This is a very common “bucket list” item for Europeans. Wearing the “Polska” vests made it easy to connect with other Polish riders and tourists. Honda had it right years ago. But in the larger examination of it, you meet kindred spirits when you travel on a motorcycle. They may not all be travelers, or even motorcyclists. Some are dreamers, some are looking back on their experiences, and some are simply curious. But they all share the common trait of friendliness…of wanting to learn your story and share theirs. Dziękuję Ci. when I was a kid, all the kids had J.C Penney Formosa Pinto mini bikes…..most were nice too. Oh Pat. It’s great to see you’re on two wheels again. Linda and I miss you. I so enjoyed your blog. 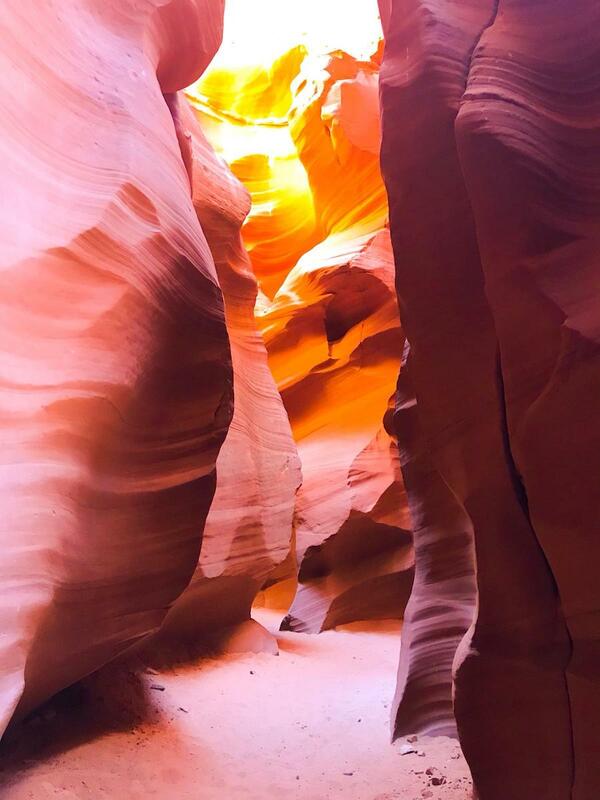 I live in AZ & I believe “Canyon X” in your pictures, is Antelope Canyon in Page, as I toured it last summer. Recently got a 2017 XT250 & ride 95% dirt single track & forest roads. Contacting Race Tech today about suspension fixes as this thing is cool but the suspension is way too soft for blasting through washes, creeks, small G-outs, desert rocks, etc. Keep up your safe riding.